Chef Fulmer plans to prepare a seared roulade of local Bowers’ Farm chicken with handmade ricotta dumplings as one of the two special entrees for the event. Fulmer notes that the dish is something of an homage to the homegrown chicken and dumplings recipes prepared by grandmothers across the Midlands for decades. One of the first New American cuisine restaurants to open in the Congaree Vista district in the late 1980s, Motor Supply Co. Bistro is renowned throughout South Carolina for its New World, made-from-scratch cuisine, award-winning cocktail program, high-quality service and casual atmosphere. 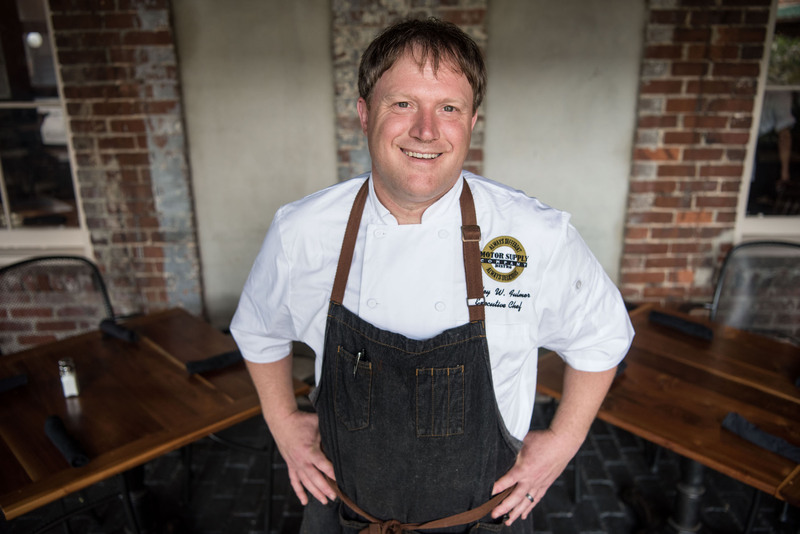 Chef Fulmer’s menu at Motor Supply puts an emphasis on local, sustainable, organic and near-organic ingredients, with an aim to support S.C. and N.C farms and producers. Almost everything is made in-house by Fulmer and his culinary team, including sous chefs Nick Rodriguez and Javier Salazar and day chef Gloria Hopkins. Dishes are created using French culinary techniques to fashion contemporary American, Asian, Mediterranean and vegetarian dishes with Southern influences for the restaurant’s daily-changing lunch, dinner and Sunday brunch menus. Read more about Motor Supply here: http://www.motorsupplycobistro.com. Chef Wesley Fulmer took the helm at Motor Supply Co. Bistro in Columbia, S.C., in Spring 2014. Featured in The Local Palate magazine and mentioned recently by Travel + Leisure, Fulmer and his culinary team have led Motor Supply to garner all three major local readers’ choice awards for “Best Restaurant” in 2015-2016 (The State, Free Times and Columbia Metropolitan Magazine). In Spring 2017, Chef Fulmer was one of the featured chefs at Columbia’s first-ever James Beard Foundation benefit dinner. After honing his craft in the James Beard Award-winning kitchen of celebrity chef Susanna Foo (Susanna Foo, Philadelphia), with stints in Boulder, CO and education in France, Fulmer served as Sous Chef at the luxe Atlantic Room at the Kiawah Island Golf Resort. Learn more here: http://www.motorsupplycobistro.com/meet/view/wesley-fulmer. Although tickets for the Newberry County Ag + Art Tour Kickoff Event are sold out, participation in the Newberry County Ag + Art Tour is unlimited, with no admission fees. The weekend-long, self-guided tour takes place Sat. June 24 and Sun. June 25, 2017. Learn more about the event at http://www.agandarttour.com/newberry.